A murder mystery weekend is only as good as the actors who put on the show. With this in mind please rest assured that we have been working with our professional murder mystery partners for many years. They have a huge fan base and we know that this is for very good reasons. Our historic hotel was built by the 3rd Duke of Argyll in the 1700's and is the original inn of the "New Town" of Inveraray. With such a unique heritage it is no surprise that our partners were really keen to add our hotel to their list of venues. 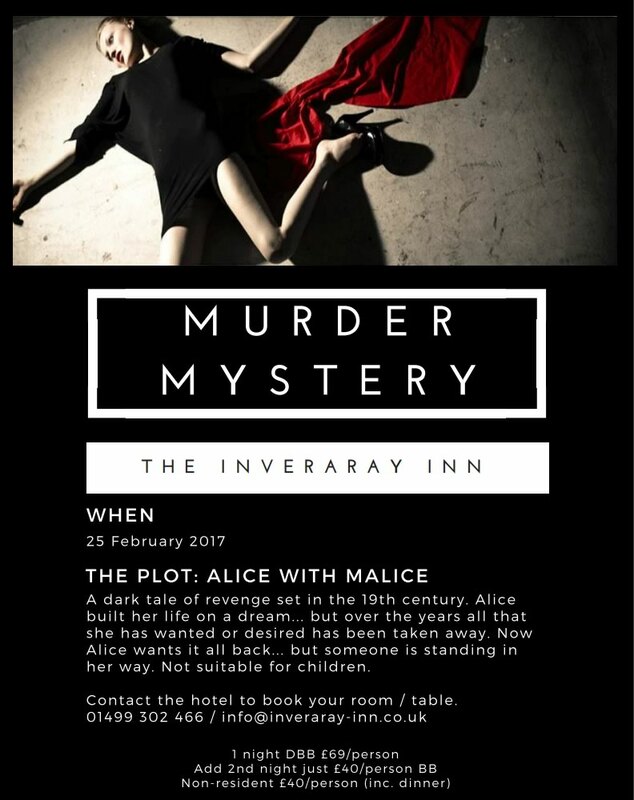 Join us this winter to experience a first class murder mystery production at our hotel in Inveraray. Please use the direct booking button above or contact the hotel by email or by phone to reserve your weekend with us. Terms & Conditions: Bookings are only valid and confirmed when a non-refundable deposit has been paid. Special Breaks such as our multi-night Christmas & Hogmanay packages attract a 50% non-refundable deposit. For Special Breaks packages like this one we require at least 7 days notice of cancellation to avoid a 100% charge.